The superfly era of the mid to late 70s has a direct influence on the Houston slab car culture. The slab car culture was born in the 1980s through Houston hip hop. 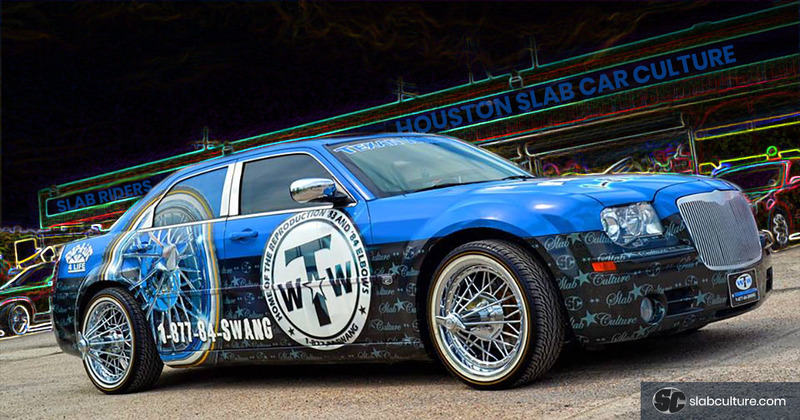 Slab cars can be seen on any freeway or street and are easily identified by their beautiful candy paint, plush interiors, and the beloved Texan Wire Wheels ’83s® or ’84s® Elbow® wire wheels, affectionately known as Swangas®. Widely recognized for reviving the ’84s® Swangas® with the 30 Spoke Elbow® style, Texan Wire Wheels is responsible for reigniting the slab car culture and is the aftermarket wire wheel of choice as well as for celebrities, music artists, professional athletes and of course loyal customers. If you ain’t pokin’ you must be jokin’is one of Texan Wire Wheels’ slogans, thus Swangas® are a must-have to an authentic slab. But you don’t have to own a slab to appreciate the culture. For everyone around the world, we are bringing the slab culture to you —- right here on slabculture.com. Southside Texas started the movement in the 1970s with Elbow Wire Wheels on Cadillacs. Slabs are custom made from other American luxury cars such as Oldsmobiles, Chryslers, Panthers, Cadillacs, Buicks, Lincolns and Panthers, due to their size. When Texan Wire Wheels started remanufacturing the ’83s® and ’84s® spoke wire wheels in 20005, it brought joy to many owners of these large size cars in Houston and around the world. The slab name stands for (S)low (L)oud (A)nd (B)angin’﻿, and this style of car customization started in Houston, Texas. An authentic slab should have Kool-Aid paint (brightly colored), hammering audio system, illuminated lights or sign in the trunk lid, custom interior, and of course the dearly loved Texan Wire Wheels 30 Spoke Elbow® wire wheels. In the video above, famed Houston rapper Paul Wall explains what slabs are about. Paul’s daily transportation is one of his numerous slab cars, so he is the expert. Shop our slab culture fashion ball caps and custom embroidery t-shirts. You don't have to be a slab rider to appreciate the culture!